(Phys.org)—By wearing clothes that have been dip-coated in a silver nanowire (AgNW) solution that is highly radiation-insulating, a person may stay so warm in the winter that they can greatly reduce or even eliminate their need for heating their home. Considering that 47% of global energy is spent on indoor heating, and 42% of that specifically for residential heating, such highly insulating clothing could potentially have huge cost savings. To avoid this waste, the researchers have used a new strategy called "personal thermal management," which focuses on heating people. 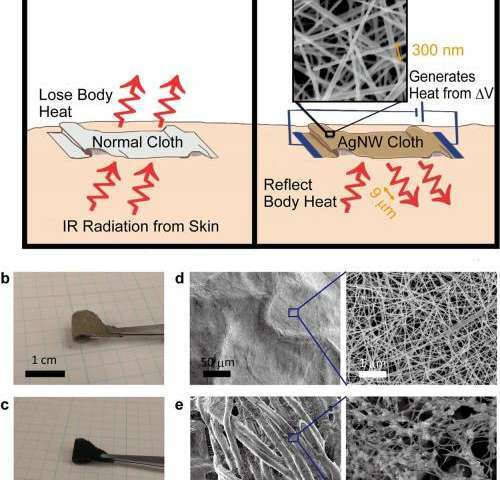 They've demonstrated that clothing dipped in a solution of metallic nanowires, such as AgNWs, achieves this goal by both providing passive insulation and allowing for active heating when connected to an external power source. The main advantage of the AgNW-coated clothing is that it reflects over 90% of an individual's body heat (i.e., infrared radiation) back to the individual. This reflectance is much higher than even the warmest wool sweater, as the average clothing material reflects back only about 20% of body heat. This increase in reflectance is due to differences in the materials' emissivity, which is a measure of heat radiation. Low-emissivity materials like silver, which has an emissivity of 0.02, emit less radiation and so provide much better insulation than high-emissivity materials like common textiles, which have an emissivity of about 0.8. Of course, wearing clothing made completely of silver would be impractical and uncomfortable, not to mention expensive. A main reason for this discomfort is that silver, like all metals, is not breathable. For example, Mylar blankets, which are made of aluminum and plastic, are extremely warm but are not vapor-permeable, causing moisture to accumulate on a person's skin. The new AgNW-coated clothing, on the other hand, is breathable due to the nanowires' porous structure. The large spacing between nanowires of about 300 nm offers plenty of room for water vapor molecules, which are about 0.2 nm, to pass through. The 300-nm spacing is still much too small to allow body heat to pass through, since human body radiation has a wavelength of about 9 µm and so interacts with the nanowire cloth as if it were a continuous metal film, and is reflected. Clothing coated in AgNWs would feel virtually identical to normal clothing because such a small amount of AgNW solution is required to achieve high reflectivity. Dip-coating cotton cloth into the AgNW solution adds a mass of just 0.1 g/m2, which would be less than 1 gram for an entire outfit. Only a small fraction of this mass is silver, so the cost would be relatively inexpensive. Using other metals such as copper, nickel, or aluminum, which have similar properties as silver, could further reduce costs. Besides providing high levels of passive insulation, AgNW-coated clothing can also provide Joule heating if connected to an electricity source, such as a battery. The researchers demonstrated that as little as 0.9 V can safely raise clothing temperature to 38 °C, which is 1 °C higher than the human body temperature of 37 °C. Variables such as outdoor temperature, length of the winter season, and home size make it difficult to calculate exactly how much energy a person would save by wearing AgNW-coated clothing. However, the researchers have calculated a rough savings estimate of 8.5 kWh of heating energy per person per day, or 1,000 kWh per year assuming that the heating system operates for four months per year. This estimate is based on the average person requiring 367 W of heating power, compared with 12 W required by the AgNW-coating clothing when actively operating. The researchers note that a 1,000 kWh savings in power consumption is equivalent to the power generated by a 2-square-meter solar panel. Plus, fabrication, installation, and maintenance of the solar panel would likely cost much more than the AgNW-coated clothing. When testing the durability of the AgNW-coated clothing, the researchers found that the clothing could withstand multiple wash cycles while maintaining its electrical properties. Surprisingly, the electrical resistance decreased after the first two wash cycles, possibly due to the removal of extra coating on AgNWs and an increase in packing density of the nanowire mesh, and the resistance stabilized after the third wash cycle. The researchers also fabricated and tested clothing coated in a carbon nanotube solution. However, although carbon nanotubes are conductive and therefore suitable for Joule heating, their high emissivity of 0.98 does not enable them to reflect body heat nearly as well as the AgNW coating. OK, enough with the "coulds". Make one of these suits, try it out for comfort and get back to us with a report. A more appealing use would be thinner insulation for suits used in the artic, space, cold planet colonization ideas like Mars One colonists will need. Sure you can turn down the thermostat but your hands and face will still get cold and what about your pets and touching surfaces, etc? The researchers sound very out of touch with their proposed solution. Or would this better insulation for buildings? Perhaps combine this 3D printed solar panels? How do you plan to keep the water pipes from freezing? Scienceguy, I have to agree. The researchers seem out of touch with reality, and I also agree that a better use for this would be to supplement insulation in buildings meant to contain people. Perhaps its use would best be as an interior coating for walls/ceilings/floors. If it is possible to make the coatings for clothing durable, then perhaps a combination of all of the above would provide the best of all worlds, but coating just clothing and eliminating interior heat does not seem practical. Looks like a good way to defeat thermal scanners if it blocks the IR. This is great technology. I had no idea that clothes were such poor insulators. I thought since they made GoreTex clothes were about as warm as they needed to be. It would be nice to be able to go out in the snow with thin clothes, and enjoy the freedom of motion while still being insulated like you were wearing full snow gear. I think if this technology is even slightly cost-effective, they should start making boots, hats and gloves with the material immediately, as they release a lot of heat and also do not get washed as often. And even if they cost $1000, someone would buy them, probably in Alaska or somewhere. Statement: So, we eliminate home heating, then the pipes freeze!?!?! Solution: YOU COAT THE PIPES WITH THIS AgNW STUFF! Insulating homes would probably be more effective. but what happens when you wash the clothes? They have obviously not tried it for real. I have. For a time I had to live in a house where the indoor temperature was just slightly above freezing. Wearing a couple of layers of long underwear, jeans and padded pants, etc. made me a bit stiff, but was manageable. So, I only have to imagine that experience without the stiff clothes. But all the things you touch are cold. The keyboard, books, utensils, anything you touch. That just pisses you off after a while. And wearing gloves is out of the question (I tried), because what you do indoors always requires dexterity and delicate touch sense. Stiff fingers and numb skin don't help doing the small stuff. Thermal scanners don't see through walls... that's a Hollywood myth. It will show you the temperature of the wall, not of the objects behind that wall. Unless you meant IR motion detectors or IR cameras used in night vision, then yes, clothes made using these would make a thief's work so much easier. Pipe freezing problem answer: Stanford California. Then there are plants, food, cats, budgies, your face, your feet on the floor, your bed when you get in it, etc etc. This may be a help to winter clothing, but inside warmth is all about triple insulated glass and R30 walls. Once you have that, residential heating demand worldwide would drop by half. In other words just build to Canadian standards everywhere. @gwrede And wearing gloves is out of the question (I tried), because what you do indoors always requires dexterity and delicate touch sense. Stiff fingers and numb skin don't help doing the small stuff. Thermo underwear, wool sweater, mylar cloth. Warp, coating your pipes with it may prevent freezing for awhile but not all winter long. The reason we are insulated is that we generate internal heat. Stagnant water in pipes does not. I can't wear silver or copper anything. It tarnishes and my skin turns orange where it was at.... how would this stuff work with that kind of problem? Ok, my heating has been off for a few days. I am heating a bedroom and a bathroom with electric heaters. This article, this idea, is exactly this good: Have a nice hot shower, dry off, grab your dirty clothes, put on your robe and walk through a freezing hallway to a warmish bedroom and finish your primping. Gads! As emergency clothing sure, as a solution to heating homes, nuts. I want warm walls for a good reason... I'd have thought this was April Fools if it wasn't so cold outside. On mars, people could wear mechanical counterpressure suits instead of pressure suits underneath, and then wear overgarments incorporating this material in the form of more conventional coveralls and coats. -These overgarments would provide both protection and warmth. They could be laundered more easily and replaced more cheaply. If this takes off I am going to buy stock in heated toilet seats. I would rather insulate my house with this than wear it. I think this would be great addition to rock wool used to insulate buildings. One reason we use feathers in clothing is the high IR reflectivity of them. This AgNW sounds like cheap breathable coating for all insulation. Give me a ski suit that is so thin it feels like Spring skiing even mid-winter. A sleeping bag that only weighs a few Oz., light weight tents. Can't this be applied to paints too? Keep the house warm by painting it. Keep the pipes underground, or with a minor circulation hot water; bleach the black mold; paint the home with this stuff and heat the home only to a minor degree. That's what. This is fascinating. Integrate copper fiber into the fabric then you have complete insulation with pain of joints and bones benefit...Hrmm. As for those who are ignorant, this could be great attire for winter sports or people who live in subzero temperatures. Halfway between Scottingham and gwrede is about right. I keep my office at around 15C/60F all winter and add a heavy shirt over a T-shirt. That's fine, but any colder and my typing speed starts to drop noticeably as my fingers get cold, even if I dress more warmly. So comfortable warm clothing helps reduce heating needs in winter, but even very warm clothing won't eliminate heating needs in cold climates (but thinner yet warm outdoor wear would be welcome). Does it tarnish like silver? Anyone fancy a tarnished shirt? I smell a new Sitcom revolving around "The Emperor's New Clothes". I always did want to meet that "tailor". Aside from the fact you'd need to be covered in the stuff head to toe to avoid a freezing face and extremities, I'm very skeptical that this would be as comfortable as a heated room under anything but a narrow set of temperature conditions. Comfortable ambient "room temperature" for most people is in the range of 70-some degrees, not the 98.6 degrees that is human body temperature. If a suit made of this material reflects 90% of emitted bodily warmth, that means the ambient temperature would need to be in a particular range of deep cold to give the wearer the sensation of room temperature - anything above and the clothing would start to be as uncomfortable as a thick wool sweater on an 80+ degree day. So unless there is a way to control the spacing of the wires and alter the material's emissivity, like others have said the material would be better suited for outdoor extreme cold-weather gear and building insulation. This would greatly cut down on the number of homeless people freezing to death every year. The human body, after the age of 9 generally exceeds 1 m^2 of area. It seems odd that this proposal ignores existing OSHA standards and also for nanoparticles cytotoxicity for which a great deal of risks are yet unknown. For instance, nanoparticles can easily penetrate cell walls and carry in other environmental hazards which can include otherwise benign cancer causing agents. Overall, that is a lot of risk for very little oddly modeled theoretical gain. Though I can see a use in situations where rooms are heated for many (offices, factory floors, etc.) and you just can't get it right for everyone. "47% of global energy is spent on indoor heating" with 47% of CO2 released can be avoided using the working solution at www.dlsc.ca heating in winter with the solar heat in summer kept inside the earth !!! This is a real working solution since 2007 and not a wrong solution using dangerous nanotubes like asbestos !!! This working solar geothermal solution must be used everywhere to save our world by 47% !!! Or hang the clothes to dry in a cold, damp room? Somehow I see air quality and mold problems in the way if interiors are left only above freezing. "47% of global energy is spent on indoor heating" with 47% of CO2 released can be avoided using the working solution at www.dlsc.ca heating with the solar heat in summer kept inside the earth !!! Anyone who has breathed in cold air will know this is a stupid idea. Reducing by a few degrees still yields considerable results in terms of energy savings. E.g. if you only need to heat your room to 15°C that means you can go a substantial amount of the year with little or no heating in many parts of the world (and it's still warm enough to avoid mold issues). No need to go the full "rip-out-all-heaters" route. I started into this article with the normal skepticism that is expressed throughout these comments, but by the end of it, I'm on board with the technology. Its anti-microbial, recoverable, and should not be terribly expensive and would be great for versatile undergarments for static occupations and tasks. I agree with the other posters that it would be even better applied to building materials -maybe a base-layer interior paint or a sheet which can be applied to the interior side of drywall (like moisture barriers now). What I would really like to see with this is an iteration which allows one to use these to neatly cover interior portals (doorways, archways, or hallways), so that one could selectively heat specific areas. Further, I think that lining the HVAC ducting with this would do wonders to reduce thermal radiation loss to interstitial spaces. As for IR-blocking clothing: I believe that a designer already developed this, but didn't release it due to cost. That would be a problem places with cool and very damp winters like Portland, Seattle and Vancouver, further limiting the use of this for indoor clothing. However around here it is enough colder outside in winter that the air inside gets too dry (even at a cool 15C indoors), with a dew point well below freezing. So there are also many places where indoor dampness would not be an issue for the main heating season. I agree with most of you that this would be a lot more practical as home insulation, or as survival wear for outdoor emergencies. TheGhostofOtto1923: I like that idea. I can just imagine the Mars explorers in T-shirts and jeans! They wouldn't be, of course, but it makes a nice image. "Skinsuits" have been an idea in sci-fi for years, but I haven't heard of NASA testing them. I also haven't heard anyone say they WOULDN'T work, so one would think the scientists would have done at least one study on them. "Development was begun by NASA and the Air Force in the late 1950s and then again in the late 1960s..."
-I picture counterpressure suits being made of self-constricting smart materials which would detect the necessary amount of force, while allowing for movement. Kind of like dynamic shrink wrap. Blankets, winter outerwear (gloves, hats, ear muffs,..), and winter underwear are obvious applications so long as it performs better (lighter and warmer) than competitive materials at a modest premium. As for the optional use of batteries, maybe for specialized apps, like winter skydiving. However, fashionable, solar-powered ski wear could represent a sizeable market. For all you guys talking about using it for painting rooms there is some stuff called ITC-100 that reflects infrared but it's not cheap. About $30 a pint. I doubt it would be any more expensive that paint made with silver nano particles though. In applied optics journal more than 40 years ago, a stack of microscope cover slides was able to reflect in spots close to 99% and was used as a laser mirror. Using the same idea I made a piece of steel of alternating layers of composition at 250k to the inch. That should have made a short wavelength mirror. The silver mentioned in the article could be used to coat paper as a thin plastic composite and used as a hot food wrap. Lots of applications better than fabric with its large surface area. Even lowering the heat to 60 degrees would be a tremendous savings over a year. Not to mention the comfort for older folks who have to burden themselves with many layers. Could you turn them inside out and stay cool? Seriously though - 90% reflectivity might be too much. The body needs to disperse heat as well as generate it. If it's electrical, install a thermostat. But you can do that already. Just wear another shirt and it's fine. Takes some getting used to anyhow, since your feet and hands will be cold, and getting in and out of the shower is a bit nippy, but you don't need fancy materials to do it. Set the thermostat at 55F; wear wool socks; wear two layers of fleece on upper body, fleece pants, & wicking wool socks; sleep under an opened sleeping bag rated about -30F; you'll be doing your part in reducing the 42% home energy consumption. but I haven't heard of NASA testing them. It seems some readers when they don't like an invention pick it apart based on literally interpreting a suggestion in the most limited manner. Since when is domestic heating only used in sub-freezing temperatures when pipes can freeze? They are at Stanford. That is their frame of reference for the need to heat or not, NOT Manitoba LOL. In a place like Stanford and any growing zone 8 or higher, it would eliminate the need for almost all heating except for the rare winter day where it gets close to freezing for a day or two. What it'd likely do is definitely reduce the use of heating in those areas. Also this would be great for polar research, or anything that needs insulation. The researcher mentioned clothing as a touchstone to help simple minds understand. Clearly he has some work to do in that regard. His example of clothing seems to confuse people rather than help them understand it. I agree with the people wondering how to keep pipes from freezing, the one reason why I keep my house at 62 F. Here, we have -45 F days, on a regular basis. A person suggested "coating" the pipe with the same but outside of tearing walls, that would not happen. Now if someone could figure out how to heat an entire house at no cost, in places like Minnesota, that would be great. I already keep my total heating bills for the seven months of colder weather at the same level as my neighbor pays on average for just one month. But free would work for me. I dress in layer, outside I just add a third. Never mount thermal insulation on the inner side of walls if you want to avoid molds. While technically true, the impact of eliminating heating in places where you don't need to heat much anyways doesn't really matter because the savings are minimal. In such climates you can add insulation to a home to the same effect and make it passively heating without compromizing your own comfort. Why bother wearing expensive high-tech clothes and be uncomfortable in a cold, damp house for a couple dollars in savings? This is just another example of journalists asking "What is it good for?" and the scientists shooting something off the top of their head, whether it's really practically relevant or not. The problem with lowering room temperature is, that it shifts the dew point inside the walls towards the interior. When the temperature of the wall is colder than the dew point, water condenses, so there needs to be some amount of heat leaking through or else your house won't be very long-lived. It starts to collect water inside the walls and rots. This is the reason why modern housing is typically wrapped in plastic under the outside wall cladding. The insulation is "too thick", so the outer layers become too cold, and to stop water from condensing into the insulation they wrap it up. Trouble is, then you need powered ventilation to keep the interior dry as well, as the tarp also prevents interior moisture from leaving. The house doesn't "breathe" on its own. In practice, wet spots form within the walls and the moisture barrier degrades and crumbles, leading to a shortened lifespan for the house. It certainly seems like lifestyle change is the biggest issue here, though it can happen with time and will with necessity. More than anything, it looks like an excellent tool for those who would use it- hikers/backpackers hit me first (I've had way too many cold nights in the mountains), but it could be wonderful for people who are most at risk during cold snaps (e.g. people who are homeless, elderly, very young, etc...) though those people generally aren't the target market in the clothing industry. Regardless, I always welcome new tech and someone, somewhere often finds a novel way to use it.